In early June 1907, friends and relatives from Illinois, Iowa, and Kansas threw a surprise birthday party for Harris Winterringer. He had just turned 85 years old. He'd been married sixty-one years and six of his children were still among the living. Harris was born on June 1, 1822 near Mount Vernon in Knox County, Ohio. All his grandparents were natives of Pennsylvania, all farm people. 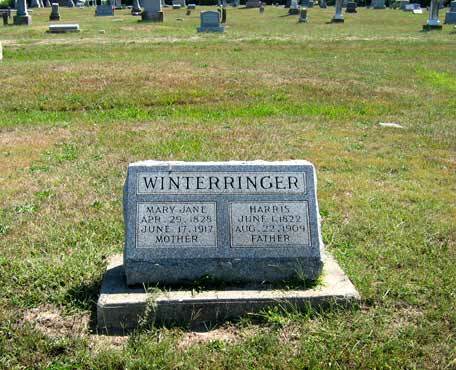 His parents Thomas and Catherine (Baker) Winterringer were also born in Pennsylvania but both moved to Ohio as children and later married in that state. Harris grew up on his father's farm. On March 26, 1848, in Ohio, Harris married Mary J. Bailie. Mary was the daughter of Robert and Sarah (Hammond) Bailie, and she was sister to the three Bailie brothers—Andrew, Gilbert, and Nathaniel—of the Fifty-first Illinois Infantry. In 1853, Harris and Mary migrated to Mason Township in Effingham County, Illinois. Harris farmed until, almost forty-years old, he enlisted in Company E of the Fifty-First Illinois Infantry, left his large family in Mason, and went off to war. This was late 1861. Harris trained for military service in cold Camp Douglas, Chicago, throughout December, January, and half of February. He escaped the regimental bouts with measles and fevers and slogged through the campaign for New Madrid and Island No. 10. He was with the regiment through the battles for Farmington and the Siege of Corinth, but he fell ill in July 1862 and was never well again until he left the army. He suffered from chronic diarrhea and was in military hospital from July 1862 through February 1863, at which time he returned to the regiment. He was promoted to corporal. But, at the end of May 1863, he fell ill again, quite ill. He was transferred to military hospital in Nashville and then Louisville. On August 14, 1863 he was discharged because of his health complications. He was so ill that the surgeon who discharged him said that he was not fit for transfer to the Invalid Corps. After his discharge, Harris returned to his farm in Illinois, and his health was wonderfully restored—his obituary in The Arcolian said he "enjoyed remarkable health" until the brief illness that carried him away. In 1868, he moved west once more—to Nebraska City, Nebraska in the southeast corner of the state. Two years later he returned to Mason. As he aged there, he turned to carpentry and established a good business. He moved from farm to town and came to own eight lots in Mason. Harris and Mary had seven children; one of them died in childhood, but Sarah, William, Corey, Louis Elmer, and John lived into maturity. Sarah was the earliest deceased, dying just a few months before her old father. During the last years of Harris' life, he and Mary lived at the home of one of their sons in Arcola. Harris died on August 22, 1909 and was buried in the Mason Cemetery in Effingham County. Mary survived him by almost eight years, living to her own ripe old age. Thanks to Judith Milde of Illinois for her research into the story of Harris Winterringer—and for the photograph of his grave. Harris Winterringer, Compiled Service Record, Records of the Adjutant General's Office, 1780's-1917, Record Group 94, National Archives and Records Administration, Washington, D.C. Portrait and Biographical Record of Effingham, Jasper and Richland Counties: Containing Biographical Sketches of Prominent and Representative Citizens, Chicago: Lake City Publishing Co., 1893, pp. 489-90. The Daily Review, Decatur, Illinois, June 4, 1907. The Arcolian, Arcola, Douglas County, Illinois, August 26, 1907.